At The British Beard Club, we’re committed to protecting and respecting your privacy. This Policy explains when and why we collect personal information about you, how we use it and how we keep it secure. By using this website you consent to the collection of your personal information in accordance with this policy. Any questions regarding this Policy and our privacy practices should be sent by email using the General Enquiries CONTACT FORM. We’re The British Beard Club, a non-political, non-orientated Unincorporated Charitable Association of Beard Aficionados raising funds for charity, and giving support, friendship, and advice to anyone wanting to grow a beard, has just started to grow theirs, or who has been a long-time beard grower. The British Beard Club is not a registered charity. We obtain information about you when you complete the membership application form and when you make online payments. The personal information we collect might include your name, address, email address, occupation, telephone numbers, social media account names, your facial hair style and colour, your comunication preferences, your hobbies and interests and your method of payment for your subscription. If you make a payment online or purchase a product from us, your card information is not held by us nor by our Web site, it is collected by our third party payment processors, who specialise in the secure online capture and processing of credit/debit card transactions. We review our retention periods for personal information on a regular basis. We will hold your personal information on our systems for as long as you are a member or as long as is necessary for the relevant activity, whichever is the longer. We will not sell or rent your information to other parties. We may contact you about any or all of these possible activities, and offer you the contact address of a Casting Agent, a Programme Researcher, a Product Testing department or a jobbing Photographer, or other organiser of an activity we think might interest you. We will NOT pass on any of your personal details to these parties. It is up to you to make contact yourself, and The British Beard Club accepts no liability for any contracts that may result from your agreements with any such parties following your decision to make contact. We may pass your information to our third party service providers for the purposes of completing tasks and providing services to you on our behalf (for example to process payments and send you mailings). However, when we use third party service providers, we disclose only the personal information that is necessary to deliver the service and we have a contract in place that requires them to keep your information secure. When you are using our secure online payment pages, your subscription is processed by a third party payment processor, PayPal which specialises in the secure online capture and processing of credit/debit card transactions. You have a choice about whether or not you wish to receive information from us. If you do not want to receive direct communications from us about our events and services, then you can select your choices by ticking the relevant boxes or sliding switches situated under the "My Communication Consents" section on the Members Personal Data Usage Consents page on the Lounge Services menu in the password-protected Members Lounge. You are given the required User Name and Password for access to the Members Lounge when you join the Club. Please keep these in a safe place and do not pass on these details. The accuracy of your information is important to us. If you change email address, or any of the other information we hold about you, you should contact us to update your information on your Membership Record. Please use ONLY direct e-mail for this - do not use the General Contact Form, but address your personal information changes to the e-mail address that we have contacted you from previously. No personal membership data is stored on the Web site other than that which you may have submitted as your publicly-viewable Club Bio text and Photographs. When you give us personal information, we take steps to ensure that it is treated securely. Data is encrypted and protected during transmission with up to 256 bit encryption on SSL, but the encryption strength actually used between the server and browser is set at the beginning of a session. Only when both support 256 bits will this encryption strength actually be used. Otherwise, the next lower level is automatically chosen. For this reason you should always use the latest browser version. All The British Beard Club's website pages are secured in this way, indicated by a lock icon or similar depending on which browser you use. You are responsible for keeping the Members Lounge login password confidential. We ask you not to share the password with anyone. 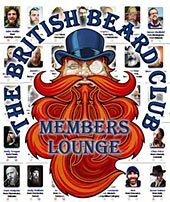 Access to the Members' Lounge is reserved for registered members of The British Beard Club. To enter the Members' Lounge, click or tap on the Club Insignia below. A Username and Password box will be presented. and in the Password box, enter the current password, which is initially issued to new Members when they join the Club. Then click on ‘OK’. Please note that the user name and the password are case-sensitive. Click/Tap on this image to Log In to the Members Lounge.